New eWeather HD 3.7 provides exhaustive set of features.They're beautifully designed, simple to use, functional and user friendly. It all works in harmony, seamlessly and beautifully. 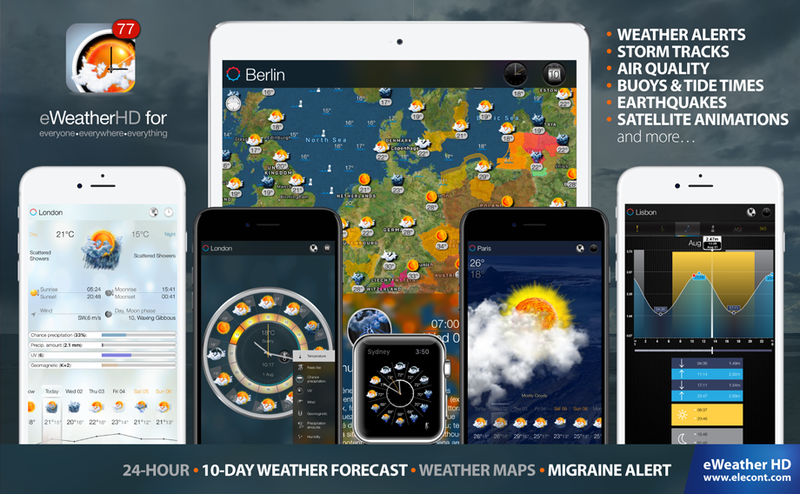 In addition to over 100 changes, enhancements, and improvements, eWeather HD 3.7 introduces PUSH health alerts (Migraine alert), severe weather alerts for Europe, Predictive weather radar and more. Major improvements in weather alerts! New eWeather HD 3.7 provides instant notifications (PUSH) for weather alerts in U.S. and Europe! * You can choose the type of alerts you want to receive! 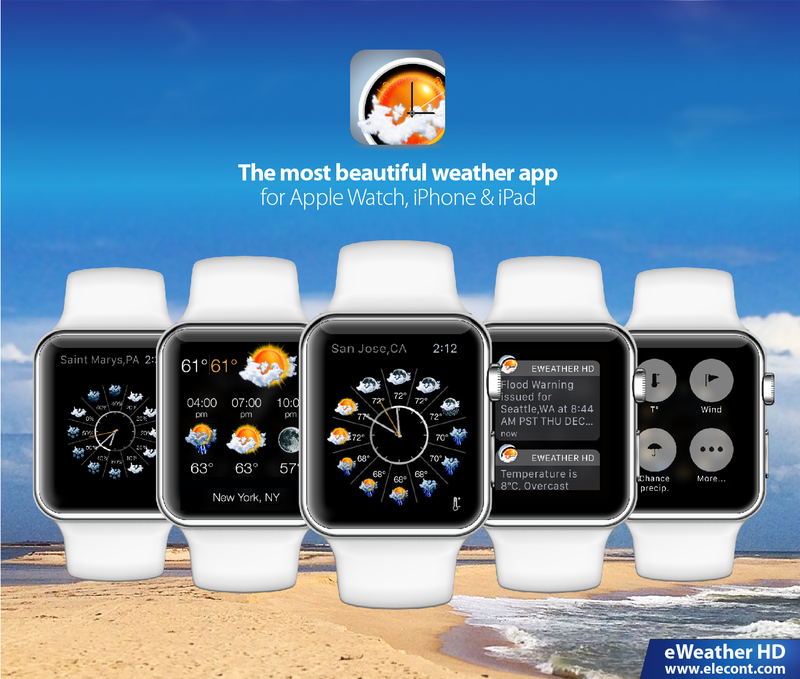 * eWeather HD provides PUSH notifications about changes in atmospheric pressure. * You can set up notification for sharp rises or drops in air pressure. * New beautiful diagrams for UV-Index and Chance of precipitation can be added to the clock face and combined with other readings. * Diagrams available in Widgets. * New Air Quality layer. Get realtime AQI measured by local or international stations. 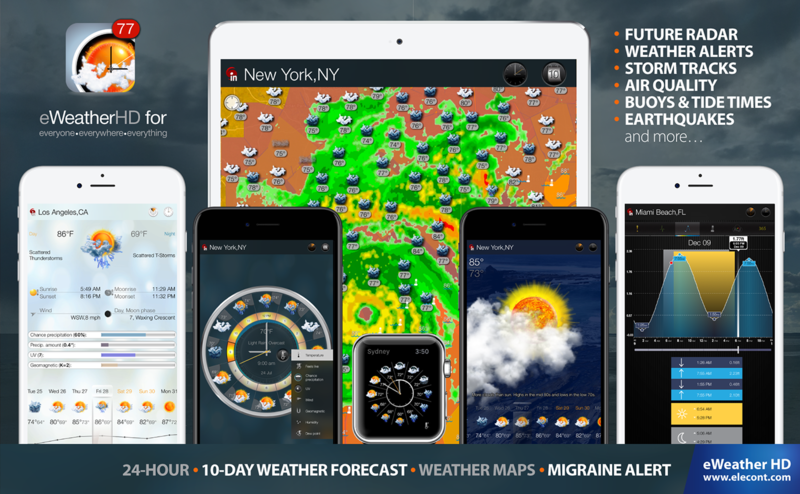 * New animated weather maps for 24-hour weather forecast or 10-day weather forecast. Available for local and international locations. * Get wind speed and direction right on the map. Play animated wind forecast for the next 24 hours or 10-days. * eWeather HD refreshes weather data in background (when the app is closed) using smart algorithms so you’ll get updated data when you open the app. It works even for “Follow me” locations. * Data from over 750 buoys scattered throughout North America, Alaska, Hawaii, Canada, Europe, and the Caribbean. Most buoys provide information about current wave heights, wave periods, wind speed, wind direction, air temperature, water temperature, atmospheric pressure, pressure tendency, dew point.